Posted on June 28, 2010 under Technology. I have been a bit busy of late, so its been a while since my last post. What have I been up to of late ? Well not much other than “work” and a few pet side projects. One of them materialized very recently as a result of a hike in the autorickshaw fares in the city. Earlier, one could calculate the fare payable by the simple formula of (10*meter-reading)-1. Life was good, but noooo… the autorickshaw unions had to go on strike to demand a raise. Following a very successful flash strike, the government relented and hiked the administered price to Rs.11 as the base fare for the first 1.6km and Rs.6.5 for every km thereafter. The result? Well other than the increased cost of an auto ride, the painful mental math needed to calculate the correct fare. In this case (13*meter-reading)-2. This got me thinking – Could I somehow make it easier for me to calculate this on my phone? So I got round to creating a simple android application for the phone (tentatively called cheater meter). 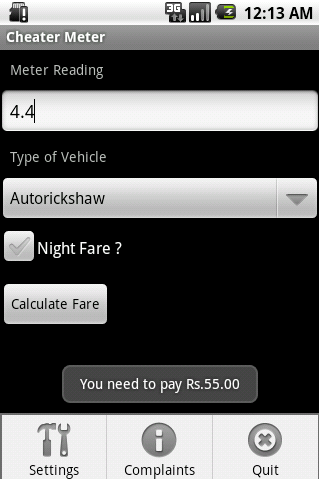 The result is a fairly nifty app that lets you calculate the fare payable for both autorickshaws and taxi’s, created in record time over two evenings (pats self on back). I’m still working out a few kinks in it and it should be coming to an app store near you soon. There will also be a web app for all the non android phones out there (in collaboration with my good pal Aditya). Watch this space for more. This entry was tagged under: Android. Both comments and pings are currently closed. Nice work buddy. Suggest you make a java based app since it will work on most phones.